There is an odd, magical-thinking element in the psychology of recent White Houses. It is now common for those within them to assume that history will declare their greatness down the road. They proceed as if this is automatic, guaranteed: They will leave someday, history will ponder their accomplishments and announce their genius. The assumption of history’s inevitable vindication is sharper in the current White House, due to general conceit—they really do think they possess a higher wisdom and play a deeper game—and the expectation that liberal historians will write the history. The illusion becomes a form of license. We don’t have to listen to critics, adversaries, worriers and warn-ers, we just have to force through our higher vision and let history say down the road we got it right. They make this assumption because they don’t know much about history—they really are people who saw the movie but didn’t read the book—and because historical vindication is what happened so spectacularly in the case of Ronald Reagan. So it will happen to them, too. Reagan had a hard, tough presidency during which his approval rating averaged around 53%. By the end of his presidency he was patronized—over, yesterday. His own people, I among them, made teasing fun of him; we all did imitations and laughed at his foibles. His was not a White House full of awed people. Even he wasn’t awed by him. How things change. 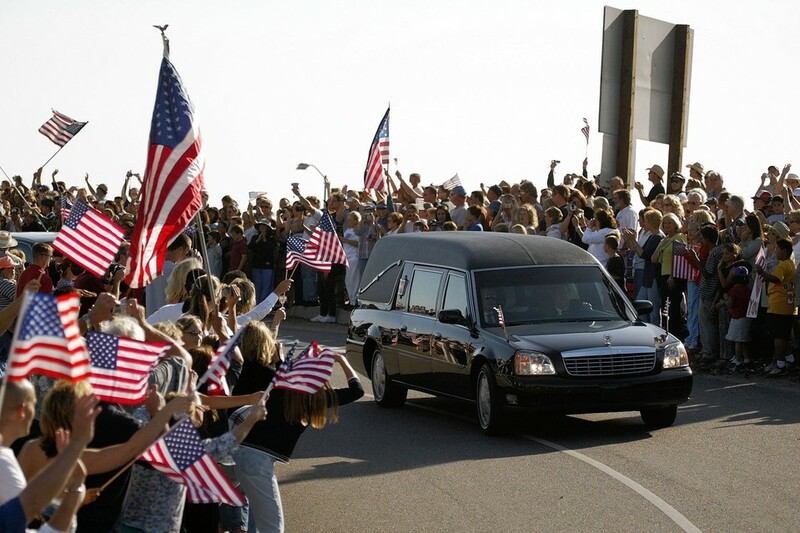 The hearse carrying the body of Ronald Reagan in Simi Valley, Calif., June 11, 2004. In the years after Reagan’s presidency his reputation experienced a reversal in public fortune. He came to be acknowledged as a truly great president. The fall of the Soviet Union was an epic moment in human history, the reigniting of the American economy brought a world of material and political implications, his ability to work with an often mean-minded Congress yielded something constructive, and even soothing, to the national psyche: Yes, things can still work. And there was the liberating factor of his funeral in June 2004, which brought a great national outpouring. They thronged to Washington and slept on the street to say goodbye, in California they went to U.S. Highway 101 to stand and hold signs—“Thanks, Dutch”—and wave flags. Nancy Reagan told me she would never forget the Vietnam War vet who put on his old uniform and stood on the side of the road, saluting the motorcade as it passed. The outpouring took the media aback, and changed the nature of their coverage. More important, seeing what was happening gave the American people a kind of permission to express what they’d long believed: This was a great man. Now when Gallup lists its greatest and most admired presidents Ronald Reagan is up there with Lincoln. A similar vindication happened with Harry Truman, though it took longer. The historian David McCullough rescued his reputation with a 1992 biography that indelibly captured Truman’s greatness—the Marshall Plan, the creation of an early, constructive strategy toward the Soviets, the bringing along, in all of this, of resistant congressional Republicans. Truman’s was not a perfect presidency, any more than Reagan’s—plenty of flaws and failures in both. But he was the last Democratic president Ronald Reagan campaigned for, in 1948, and the one he most loved to quote, devilishly but sincerely, as president. ObamaCare, whose very legitimacy was half killed by the lie that “If you like your plan, you can keep it,” and later by the incompetence of its implementation, has been done in now by the mindless, highhanded bragging of a technocrat who helped build it, and who amused himself the past few years explaining that the law’s passage was secured only by lies, and the lies were effective because the American people are stupid. Jonah Goldberg of National Review had a great point the other day: They build a thing so impenetrable, so deliberately impossible for any normal person to understand, and then they denigrate them behind their backs for not understanding. I don’t know how ObamaCare will go, but it won’t last as it is. If the White House had wisdom, they’d declare that they’d won on the essential argument—health coverage is a right for all—and go back to the drawing board with Congress. The only part of the ObamaCare law that is popular is its intention, not its reality. The White House should declare victory and redraw the bill. But the White House is a wisdom-free zone. The president’s executive action on immigration is an act of willful nihilism that he himself had argued against in the past. It is a sharp stick in the eye of the new congressional majority. It is at odds with—it defies—the meaning and message of the last election, and therefore is destructive to the reputation of democracy itself. It is huge in its impact but has only a sole cause, the president’s lone will. It damages the standing of our tottery political institutions rather than strengthening them, which is what they desperately need, and sets a template for future executive abuse. It will surely encourage increased illegal immigration and thus further erode the position of the American working class. And there is the Keystone XL pipeline and the administration’s apparent intent to veto a bill that allows it. There the issue is not only the jobs the pipeline would create, and not only the infrastructure element. It is something more. If it is done right, the people who build the pipeline could be pressed to take on young men—skill-less, aimless—and get them learning, as part of a crew, how things are built and what it is to be a man who builds them. Which is sort of the spirit of this White House. Great presidencies have a different one. They expand, move on, reach out. The future acknowledgment of greatness only follows actual greatness. History takes the long view but in the end relies on facts. “But history will be written by liberals.” Fair enough, and they will judge the president the more harshly because he failed to do anything that lasts. ObamaCare will be corrected and torn down piece by piece. The immigration order will be changed, slowed or undone by the courts, Congress or through executive actions down the road. Keystone will pass and a veto overridden. And the president has failed liberals through unpopularity, which is another word for incompetence.